My favorite day of the week, conveniently scheduled on Friday. Today I have another cornbread recipe to share. Big surprise there. Cornbread is kind of my jam. I hope it's yours too, because I sure posta lotofit. For this next version, though, I really tried to think outside of the box. 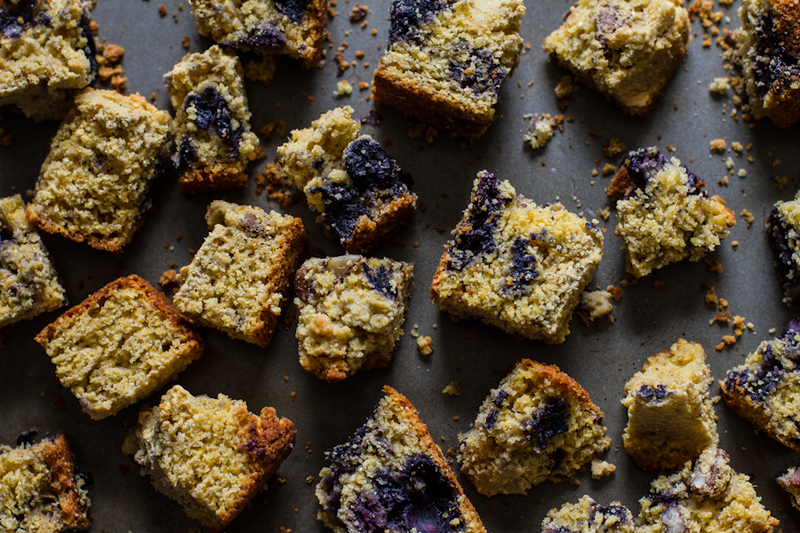 I was browsing through my cornbread archives--which I should probably have an entire page devoted solely to--and remembered one of my favorite recipes for blueberry pecan cornbread. 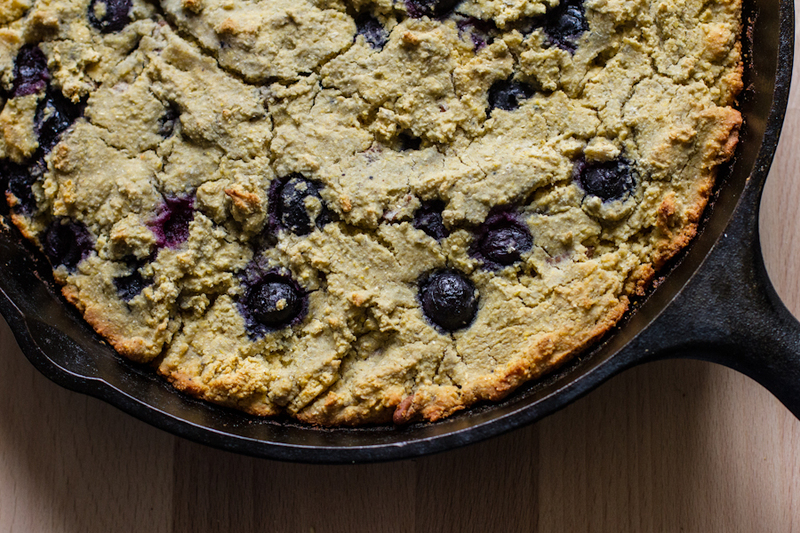 It's a little sweeter and more interesting than plain cornbread and perfect for breakfast. Then, I got to thinking about my love for bread pudding/French toast bakes and wondered if combining the two would work. And boy did it ever. After the cornbread baked to a deep, golden brown I sliced it into squares and toasted it up a bit. I consumed cube after cube because I have no restraint when it comes to cornbread. Lucky for me I made 2 batches. Or, maybe, lucky for you? If it hadn't been for that second batch you probably wouldn't have this recipe today. And while you could slather these toasted, cornbready nuggets in a little butter and call it a day we've got bigger plans. After soaking the cubes in a milk + egg bath you send it to the oven to bake into a thick, doughy, cakey-bready, scoopable, breakfast, treasure. Yeah, there just aren't enough descriptive words for this one. After a little honey drizzle all you have left to do is dig in. Preheat oven to 400* F and place 2 tablespoons of butter into a 9-inch round pan [cast iron works great!]. Melt 1 tablespoon of butter and let cool for a few minutes. Stir the cornmeal, masa, oat flour, baking powder, and salt together in a large bowl. In another bowl whisk the egg then whisk in the milk, honey, vanilla, and melted butter until fully combined. Pour the wet into the dry and stir until just combined [when you no longer see dry flour]. Immediately and gently fold in the blueberries and pecans, then let the batter sit undisturbed for 7-8 minutes. While the batter sits place the pan with the butter in the oven for just a few minutes until melted. Remove and carefully rotate the pan around to coat the bottom and sides with the melted butter. The excess will pool at the bottom which is normal. Without stirring, scrape the batter [it will be very thick] into the hot pan and gently spread it to the edges with a spatula or large spoon. Bake for 24-28 minutes until the edges are a deep golden brown and a toothpick comes out clean. Let cool for at least 30 minutes before slicing into large pieces and then move to a cooling rack to fully cool. Cornbread is fragile while warm. *If not making the bread pudding mix in a rounded cup of blueberries and 1/2 cup pecans. Use unrefined coconut oil to make dairy free. Once fully cooled preheat your oven to 350* F and slice cornbread into 1-inch cubes. Spread 7-8 cups on a large rimmed baking sheet and bake for 12-15 minutes until lightly toasted. While cooling, whisk the milk, eggs, honey, vanilla, cinnamon, and salt together until fully combined. Place the cooled cornbread cubes in a greased 8-9-inch square pan and pour the wet mixture over top. Remove from the fridge and gently turn the mixture over in the pan so the top pieces are on the bottom. The mixture will become a bit crumbly but that's fine. Cover with foil and bake for about 40-45 minutes until the mixture feels set to the touch but with a slight bit of give in the center. If the mixture still seems very wet and gooey, bake covered for another 5-10 minutes. Then, bake uncovered for 12-15 minutes until light golden brown. Let sit for 10-12 minutes to firm up before serving. Serve with honey and refrigerate leftovers. 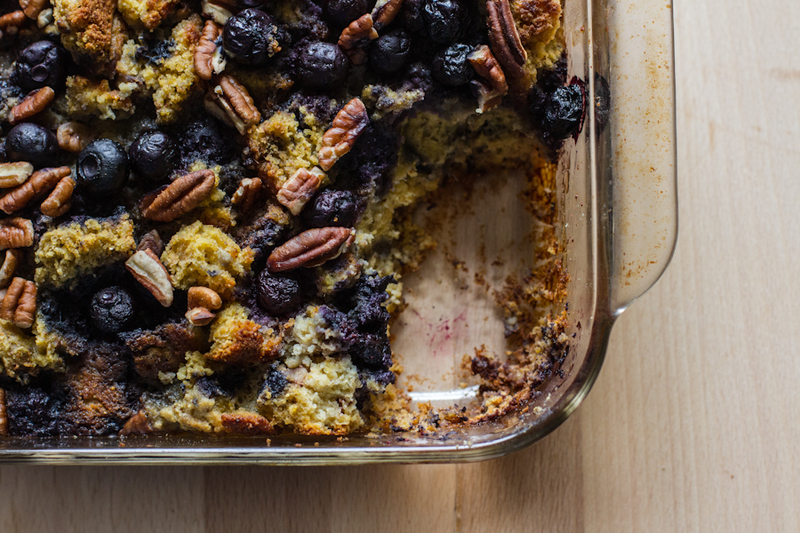 Looking for a gooey vegan bread pudding similar in style to this? 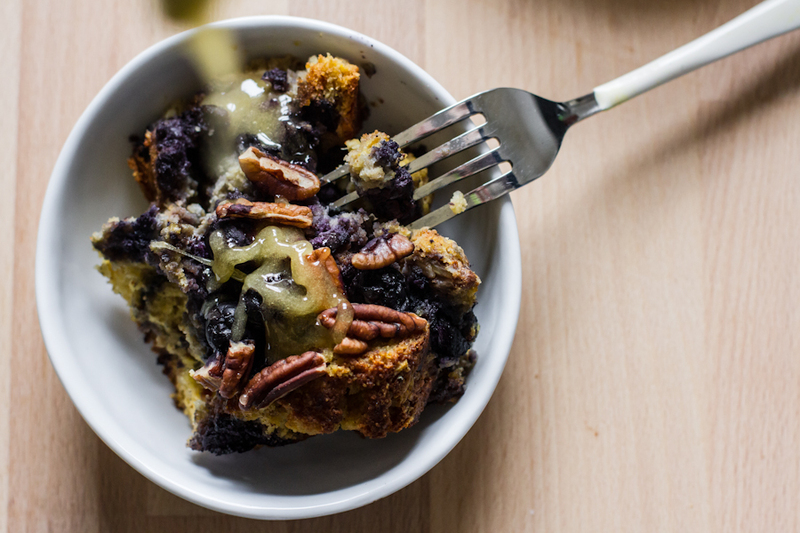 Check out my recipe for vegan blueberry muffin bread pudding. It is to die for! #bfastfridayclub <--- Check out all of your instragrammed photos over on my facebook feed! Thanks for posting. I just love seeing what you all come up with! *Don't forget! * I'll be signing copies of Baked Doughnuts for Everyone tomorrow at The Learned Owl Book Shop in Hudson, OH from 1-3pm. I absolutely cannot wait and hope to see some of you there!